Clent Davis of Montevallo, Alabama has successfully pulled off a historic comeback to win the Fishing League Worldwide’s (FLW) 2018 Forrest Wood Cup, the first angler to start the final day in 10th place and finish in first. Davis came into the live weighing event Sunday with a five-bass limit weighing 17 pounds, 13 ounces – the heaviest limit weighed in the three-day event. Davis also amassed 15 fish, totaling 36 pounds, 13 ounces, seven pounds better than second-place James Niggemeyer of Van, Texas, to win the $300,000 top cash prize. Davis returned to the world of competitive fishing when he was invited by FLW Tour Senior Tournament Director Bill Taylor. It’s no surprise that Davis’ decision to rejoin the Tour was the correct one as he went on to finish the season ranked No. 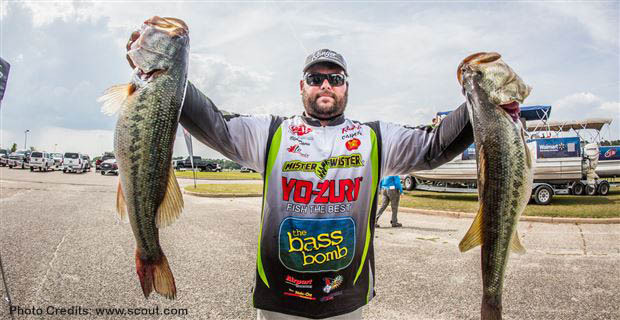 25 in the Angler of the Year race – his best finish on the Tour since his rookie season. The 2018 Forrest Wood Cup at Lake Ouachita in Hot Springs, Arkansas was hosted by the Arkansas Department of Parks and Tourism and Visit Hot Springs. Total attendance for the three-day event was 66,293 fishing fans. The Bank of the Ozarks Arena was at 100-percent capacity on Sunday and an overflow of fans watched the Justin Moore concert and final weigh-ins on a big screen at the Hot Springs Convention Center. Here is a list of the Top 10 finishers in the 2018 Forrest Wood Cup on Lake Ouachita.